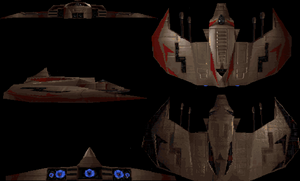 The Goran is a Kilrathi fighter-bomber introduced at the end of the Terran-Kilrathi War. The design saw its first combat in early 2669 when the KIS Shiraak lured the TCS Lexington to the Evian System, where the Empire was testing the first production Goran fighters. At the time the design was the heaviest Kilrathi fighter ever produced. This record was quickly superceded by the Sorthak. Goran Target Identification, circa 2669. This page was last edited on 26 June 2011, at 20:00.